Computers… at home, at work and at play we take these technological marvels for granted yet not long ago we did not compute anywhere. The introduction of computers began at the workplace and, chunky and clunky as they might have been, they were a revelation at the time. Let’s look back and get digital with early office computers! 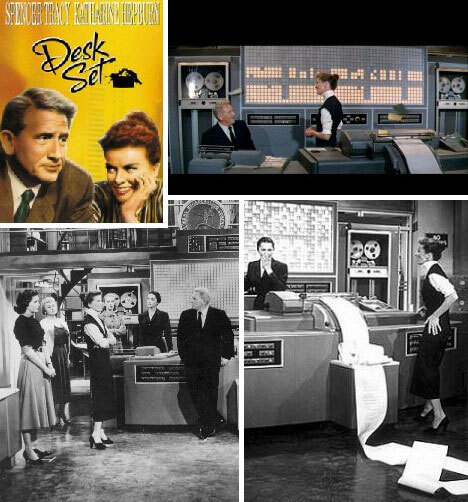 Desk Set was a major motion picture from 1957 starring Spencer Tracy and Katherine Hepburn. The “out with the old and in with the new” plot reflected the feelings many office workers had about computers: they were big, impersonal and could cost you your job. 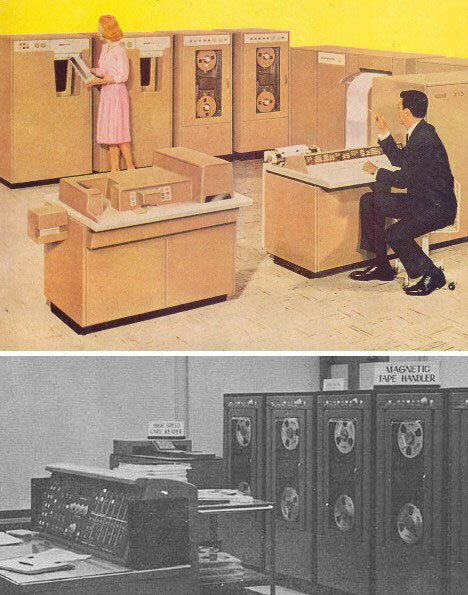 A lot has changed in the past half-century… computers are no longer big. IBM 360 > HAL 9000? 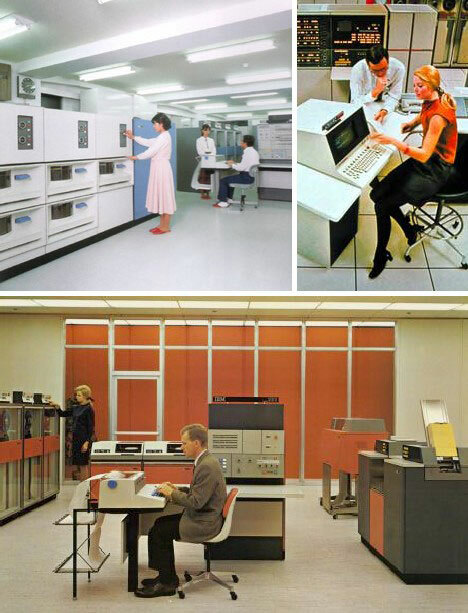 With the introduction of System 360 in 1964, IBM set the standard for the institutional mainframe computer. 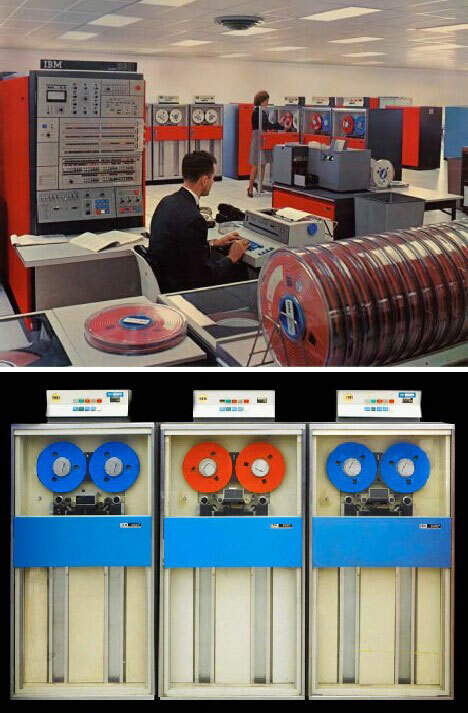 Those banks upon banks of cabinets housing colorful, steadily spinning tape drives seen in classic 60’s flicks In Like Flint, the Matt Helm series and most any Bond film were all inspired by System 360… and probably 2001: A Space Odyssey’s malevolent HAL 9000 was as well. It’s no secret that the letters “HAL” are IBM, set back one letter per letter. You knew that, right? 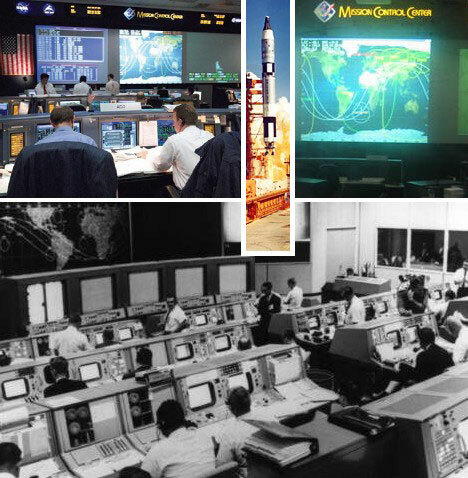 Television broadcasts showing NASA engineers huddled over their readout screens at the Manned Spacecraft Center’s Flight Control Room 1 (FCR-1) were, for many in the 1960s, their first introduction to computer terminals. 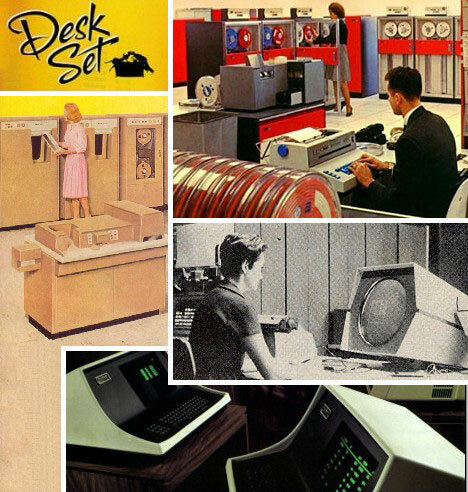 It’s not hard to imagine office workers a decade later feeling a special thrill when their own office desktop terminals were installed. 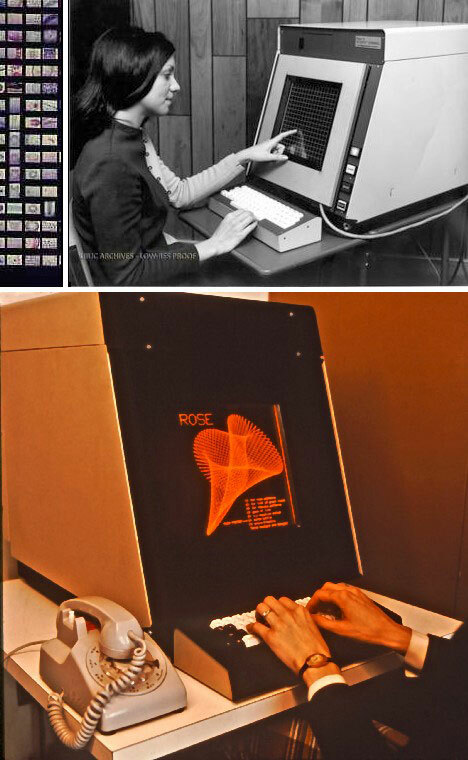 One of the first desktop terminals that featured a screen was the cyclops-like PDP-1 from DEC. A marvel to behold in 1960, the PDP-1’s main claim to fame is that Spacewar, the very first video game, was specially developed for it by Steve Russell at MIT. At some point, somebody came up with the idea of separating the mainframe from the so-called “dumb terminal”, many of which could then access the CPU via serial cables. 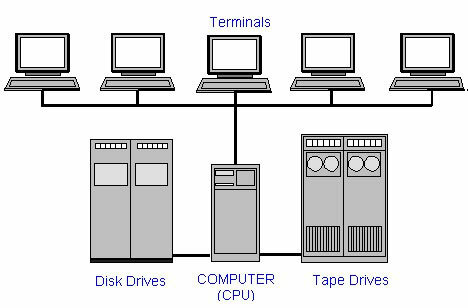 Anywhere from a few to a few hundred dumb terminals enjoyed equal access to the CPU and its files, stored remotely on tape drives at first, disc drives a little later. 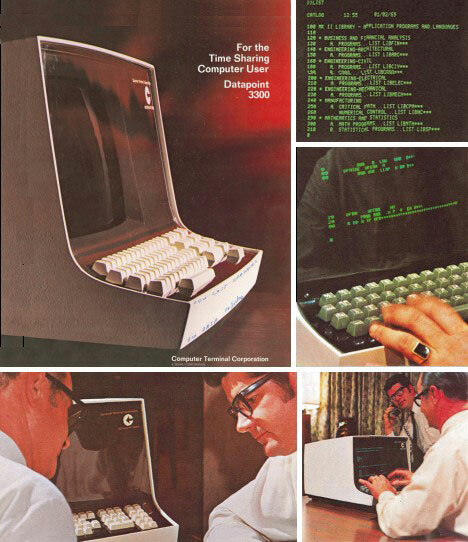 One of the earliest of the dumb terminals was the CTC’s Datapoint 3300 from 1969. CTC stands for Computer Terminal Corporation… not the most inspired company name. Boring or not, CTC managed to struggle on for another thirty years before finally fading out in the 2000 dot-com bubble burst. 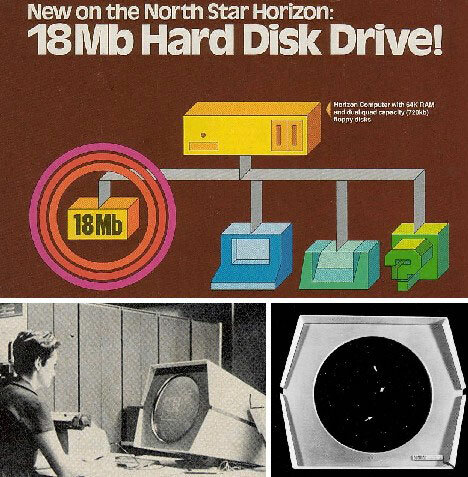 By the late 1970s branch offices in distant cities could connect to company mainframes through existing phone lines while the hulking master computers hunkered down in chilly, temperature-controlled clean rooms. 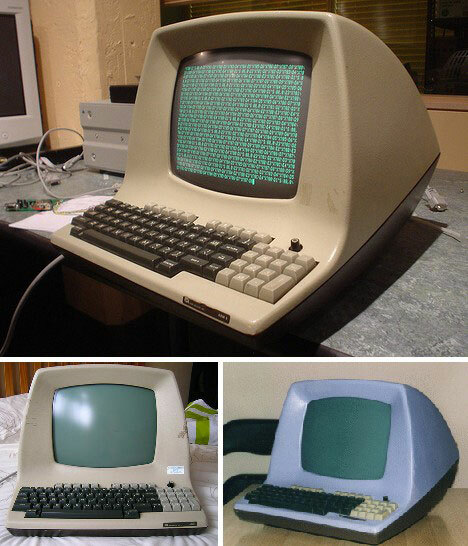 Around this time desktop video display terminals (VDTs) began to assume a common design theme: a rounded plastic shell that housed a monochrome CRT screen and integrated keyboard. Above is one of the more stylish designs, the Lear-Siegler ADM-5 video display terminal. Many companies made VDTs in the roughly 10-year window between the advent of affordable office computing systems and the introduction of self-contained desktop PCs. Digital Equipment’s VT100 was perhaps the most popular of the bunch. 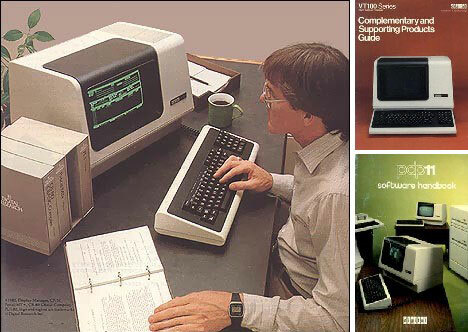 First sold in the summer of 1978, the VT100 boasted ANSI-compliance and a choice between two display formats: 80 columns by 24 lines or 132 columns by 14 lines. Graphics? Sure… if you like ASCII art. Before there was the Internet, there was PLATO – a project that started in 1960 as an experiment in computer education and eventually grew to a thousand-terminal network in the mid-1970s before finally shutting down in 2006. Along the way, PLATO introduced many thousands to concepts we take granted today, such as chat rooms, email, discussion forums, instant messaging and multi-player games. 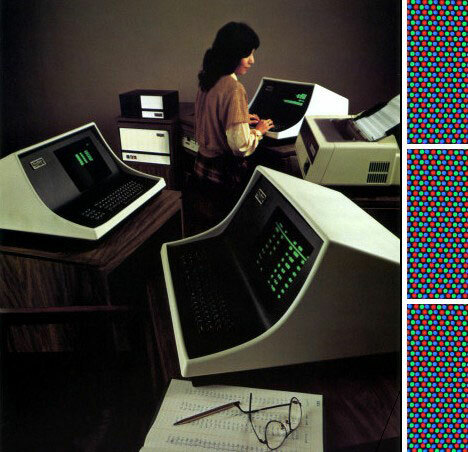 PLATO terminals, built by Control Data, featured an orange plasma display that could support bit-mapped graphics. They also had a 16-by-16 grid infrared touch panel students could press to answer questions. Advertisers, marketers and basically anyone who want to appear cutting edge and ahead of the curve fell in love with the organic yet futuristic look of nicer VDTs like DEC’s VT-125 and used them to full advantage in concept ads of the day. The leap from imposing mainframe computers of times past to desktop PCs and laptops happened seemingly overnight. Not only a physical changing of technological gears, the Big Change was in reality a paradigm shift in the way people thought about computers. Impersonal became personal; Central Processing Units taking up entire rooms were cut down to size and squeezed onto a mere chip. Goodbye dumb terminals, hello smart phones… nice to know humanity’s subservient relationship with our electronic overlords wasn’t as “terminal” as some had thought!